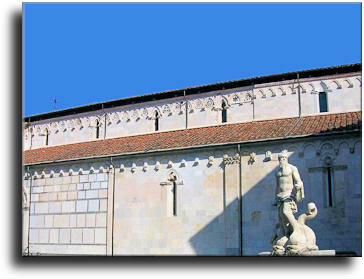 The Cathedral was built between the XI-th and XIII-th century. It shows a fine facade covered with white and grey marble-made strips and a main portal sided by two pillars, equipped with decorated capitals holding a round arch. On the higher part of the facade it is possible to admire a fine rose window and in its sides a gallery surmounted by little arches, being this latter held by columns and pillars. The interior of the Cathedral has three aisles, of which those sided ones are enriched of fine frescoes and bass relieves portraying Biblical pictures. Very interesting to see is the Sepulchral Arch entitled to Saint Ceccardo, who was Bishop of Luni and protector of the town, and a painted Cross portraying in the middle a "Christ", on top an "Eternal Father", down an "Our Lady and Saint John", and on the two sides the "Evangelists". Inside the Cathedral it is also possible to admire numerous marble-made art works by local artists like the pulpit and the founts placed in the choir, and the marble-made altarpiece, placed close to the main altar, consisting of numerous statues portraying an "Our Lady with the Child and Saints". By passing a door placed inside the religious building it is possible to enter in the Oratory-Baptistery, whose middle there is a marble-made tub showing a hexagonal shape and some fine decorations.